More than 21000 vacancies are available in police constable jobs. 10+2 pass candidates can apply for the posts. The recruitment is open till the end of July. More details in constable vacancies are mentioned here. Huge vacancies are available for graduates and senior secondary pass candidates. Near about 22000 constable vacancies are available in different States. Vacancies are available at major recruiting bodies like Meghalaya Police, Uttar Pradesh Police and Gujarat Police. Eligibility requirements vary for different recruiting bodies and the vacant posts. Candidates, who are interested for this job, need to go through the detailed information prescribed by each of the recruiting bodies. 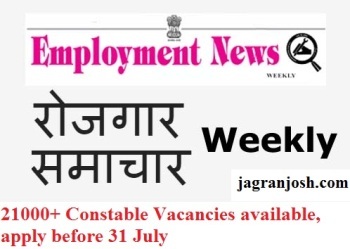 2707 vacancies are open for recruitment at Uttar Pradesh Police. Applications are invited from eligible graduates. The last date to apply for UP Police Sub Inspector, Platoon Commander (PAC) and Fire Officer (Grade II) recruitment is 29 July 2016. Under UP Police 2400 SI posts, 210 Platoon Commander (PAC) and 97 Fire Officer (Grade II) posts are available for intake. Uttar Pradesh Police will follow strict selection procedure for selecting the right candidates. The selection of the candidates for UP Police will be done on the basis of online written examination and PET which would be conducted by PRPB. The online written examination for UP Police Recruitment 2016 will be of total 400 marks of subjects including General Hindi, General Knowledge/ Law/ Constitution, Numerical and Mental Ability Test and Mental Aptitude Test/ Logical Reasoning/ Intelligence Test of 100 marks each. Considered to be the biggest recruitment drive ever in the State, Gujarat Police has a total number of 17500 vacancies. Applications are invited from 12th pass candidates in the age group of 18-33 years. Candidates will be selected on the basis of their performance in written test, PET and interview. Interested candidates should send their application online on or before 30 July. Meghalaya police has a total of 1705 vacancies for recruitment to UB-Sub Inspector, AB-Sub Inspector, Unarmed Branch Constables, Fireman, Driver Fireman, MPRO Operator Constables, WPC, Armed Branch Constables, State Battalion Constables & IRBN Constables, Handyman Constables, Rider Constables, MPRO (General Duty Constables), Mechanics, Driver Constables, Buglers and Armourers. The selection of the candidates will be done on the basis of the interview/written exam/PMT conducted by the organization. Applications are invited from 10+2/ Class 5/ Class 9 pass candidates. Interested and eligible candidates are required to submit their applications before 31 July 2016.